Have you ever been stuck with heinous roaming fees when traveling abroad? Kinda takes the fun out of posting pictures or watching videos when you’re not within WiFi range. 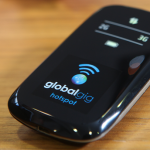 Globalgig has just launched its carrier grade mobile internet service with a hotspot device that connects with local networks through your smartphone, tablet or laptop. You don’t have to switch you SIM card, nor deal with your carrier to buy a special data plan. The device costs $119 and can connect up to five devices at speeds up to 7.2 MB per second. But hey, I had a hotspot for years. What makes Globalgig different is that [drum roll] there’s no months-long data plan. You can cancel or make changes just by contacting the company 48 hours before the end of your billing cycle. That kind of freedom is great, particularly if you only travel at certain times. This past year I paid for my hotspot plan with a certain US carrier for 12 months but only needed it for two of those months when I was overseas or away from WiFi. Yes, I put my plan on hiatus but that only added months at the end of my plan (or face charges for an early termination). Copyright © 2019 Wordulator - Tech and Travel and Just Plain Cool Stuff.